A fond farewell from Ahram Online's live update team to all our readers. We started the day president-less, but after a week of tension and widespread speculation over the outcome, Egypt, finally, has a civilian head of state, the Muslim Brotherhood's Mohamed Morsi. 17:40 Head of the ruling military, Field Marshal Mohamed Hussein Tantawi has congratulated Mohamed Morsi on becoming Egypt's new president, according to reports. 17:35 The head of the moderately Islamist Wasat Party has said it will "stand with our elected president". But party head Abul-Ela Madi said it would also "correct [Morsi] if he is wrong", adding that the revolution will prevail. 17:23 Red flags in hand, Egypt's Revolutionary Socialists are urging the new president not to take his oath before the country's High Constitutional Court. The movement also said people should not leave Tahrir and instead continue their protest against the recent constitutional declaration and a new decree that lets military police arrest civilians. It also called for a referendum on last week's dissolution of parliament. "President Mohamed Morsi begins talks to form his presidential team and a new cabinet that will truly represent Egypt after revolution"
17:10 There's been a moment of respectful silence to mark the revolution's 'martyrs' at Morsi's campaign HQ, says Ahram Online's Yasmine Fathi. Attendees are now singing the national anthem, she says. 17:02 The tweets are coming in thick and fast after the announcement of Morsi's victory. "Remember our martyrs -- without them today wouldn't have existed." stressing that "Now it's time to stand united. If we really care for this nation we must stand united behind the man for whom the people voted." "Reassure those in fear, reassure the Copts. I voted against Shafiq and I know that many voted for him out of fear for the Muslim Brotherhood. We need to reassure the people." "As Egyptians celebrate their freedom, we pay special tribute to the martyrs of the great Egyptian revolution, their blood did not go in vain"
"Our revolution continues against the ruling military and the Brotherhood's supreme guide. Congrats Egypt!" adding that "My differences with the Ikhwan aside & my deep opposition to their politics, I am very happy Shafiq lost! And we must give Morsi a chance." 16:52 There are ecstatic scenes at Morsi's campaign headquarters in downtown Cairo, says Ahram Online's reporter on the scene, Yasmine Fathi. Among the chants: "Revolutianaries, free - we will continue the road"; "Long live the Egyptian people, the martyrs' blood has not gone in vain"; "Freedom, justice, Morsi's men are behind him"
16:47 Tahir Square has exploded with wild celebrations following the announcement of Morsi as Egypt's new president. The Brotherhood's candidate received 52 per cent of the vote, making him the country's first post-Mubarak president. 16:25 All is calm inside Shafiq campaign headquarters, according to Ahram Online's Sarah El-Rashidi at the scene. "Everyone looks very relaxed and confident, with smiles on their faces," she tells us by phone. "Every time a violation is reported against Morsi, everyone claps." 16:18 Head of the electoral commission, Farouq Sultan, is still reading out his exhaustive list of electoral violations, adding to the suspense as people wait for the results. The speech is so long that Twitter users have created hashtags such as #Sultanboringustodeath and #thingstodowhilesultanspeaks. 16:08 The head of the electoral commission says that of 456 appeals, two in particular caught their attention. The first related to a claim that upwards of one million voting ballots were found marked in favour of one candidate before they reached the polling station. The other claims Christians were stopped from casting their votes at one polling station in a village in the Upper Egypt governorate of Minya. But he says both alleged incidents could not be verified; in the first instance, SPEC could only identify close to 2,400 pre-marked ballots, in the second the turnout at the polling station in question was comparable in the runoffs to the first round. 15:35 Dozens of Morsi supporters are marching in the coastal city of Alexandria, political analyst and columnist Amro Ali tells Ahram Online. Ali says the crowd is marching to SCAF's headquarters in the northern part of the city from the Qiad Ibrahim mosque. They are calling for a second Egyptian revolution even before the results are announced. 15:28 Tense expectation reigns at the central Cairo headquarters of Mohamed Morsi's campaign, according to Ahram Online's Yasmine Fathi at the scene. A press conference there is packed with reporters awaiting the result. A screen in the centre of the room shows live footage from Tahrir Square and other parts of Egypt. Members of the Freedom and Justice Party's High Committee are expected to arrive shortly. 15:14 Cairo's eastern district of Nasr City, a frequent rallying point for Shafiq supporters, is playing host to a crowd of just a few dozen. Thousands gathered there on Saturday, chanting slogans against the Brotherhood and in favour of Ahmed Shafiq, bringing traffic to a halt. 15:08 One protester in Tahrir Square tells an Ahram Online reporter of his fears that Shafiq will win. "If the votes are fair, why are they afraid to announce them?" asks Hanan Mahrous, a 23-year old graduate student. 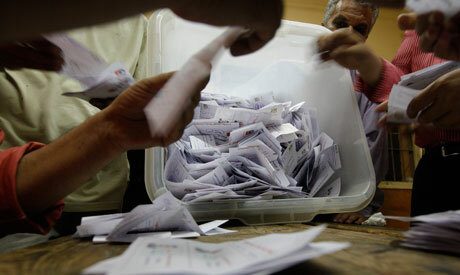 Mahrous voted for Hamdeen Sabbahi in the initial vote then Morsi in the second round. “How could anybody vote for someone whose role model is Mubarak?" she asks. "The Egyptian law copies French law in everything . Why did it not copy the presidential elections system there and have early results?" 15:01 Members of the Egypt's presidential electoral commission arrive at the committee's headquarters in Nasr City. The announcement is to be made in a hall already crowded with Egyptian and international media. The result is expected in a few minutes. 14:59 Ahram Online reporter Bel Trew describes scene around Tahrir Square where thousands of mainly Morsi supporters are demonstrating. She says some supporters are riding around the square on the back of fun-buses, blaring music that proclaims "we are one hand". 14:58 The Rafah crossing between Egypt and the Gaza Strip has been closed at the order of Egyptian authorities, according to an official from Hamas which governs the besieged territory. Egyptian authorities are yet to make a statement on the matter. 14:55 Former presidential candidate Abdel Moneim Abul-Fotouh will hold a press conference on Monday to comment on the election results, his campaign managers say. 14:53 The headquarters of Egypt's electoral commission in Nasr City are stepping up security ahead of the 3pm announcement. Security barriers have been erected around the premises, while streets surrounding the bulding have been closed and no vehicles allowed in. Journalists have been granted access on foot but are being extensively searched in an apparent attempt to prevent supporters of either candidate from causing trouble. 14:45 The Muslim Brotherhood is saying it won't leave Cairo's Tahrir Square, even if its candidate Mohamed Morsi is declared president. Speaking to the local Dream TV channel on Sunday, Hassan El-Barnes - a leading member of the Brotherhood and a former MP for its Freedom and Justice Party - said the sit-in will continue. "The protesters in Tahrir have demands, most importantly cancelling the constitutional addendum that makes the SCAF a state above the state and turns Egypt from a civilian state to a military one which limits the president’s powers," El-Barnes said in an interview on 'Sabah Dream'. "Our protests will remain peaceful and we will not leave ‪#Tahrir until the peoples' demands are met, including recent ‪#SCAF decrees." 14:20 Dozens of Morsi supporters marching from the central Cairo district of Abdeen have arrived in Tahir Square. They're shouting "Legitimacy is in Tahrir … revolutionaries are in Parliament", and "Shafiq tell the truth, is Morsi your president or not?" Carrying the Egyptian flag and pictures of the Brotherhood candidate, the protesters are calling for the implementation of the Political Disenfranchisement Law which would have eliminated Ahmed Shafiq from the presidential race. They're also rejecting the 19 June constitutional addendum issued by the ruling military as well as last week's dissolution of parliament and justice ministry decree allowing military police to arrest civilians. 14:12 The government of current Egyptian premier Kamal El-Ganzouri will resign immediately if Mohamed Morsi is announced president, says Ahram's Arabic-language news site, quoting "government sources." But should Ahmed Shafiq prove victorious the resignation will be postponed, the report claims. Ganzouri's government was appointed by the Supreme Council of Armed Forces (SCAF) in December 2011. According to the constitutional declaration, it will be relieved of responsibility on 30 June. There's less than an hour to go before Egypt is due to hear the official results of the country's first post-Mubarak presidential elections. The Supreme Presidential Electoral Commission (SPEC) announced Saturday that it will declare the new president at 3pm today. The winner will then be inaugurated on 30 June. Tensions are riding high and security forces have permeated the capital's streets as these polarising elections that pitted Muslim Brotherhood candidate Mohamed Morsi against Mubarak's last premier, Ahmed Shafiq, draw to a close. There are widespread rumours that supporters of the two candidates may clash or react violently to the outcome. The Ministry of Interior has said it has put its forces on a heightened state of alert. Government institutions, schools and several embassies have either closed entirely or have let their employees return home early before the results are announced. Thousands have gathered in central Cairo's Tahrir Square over the last week, the majority of them Morsi supporters, protesting new changes to the country's constitution and the dissolution of parliament. Shafiq supporters, meanwhile, made their voices heard in the eastern Cairo district of Nasr City on Saturday. Blocking a main road for hours, they protested against the Brotherhood and declared support for their candidate. Follow Ahram Online for the latest developments. Brother Mosri, First dismantle military generals, establish revolutionary army like Iran and arrange job for youths, remember shaheeds who sacreficed their lives for Islam and democracy. Be careful about CIA,MOSSAD, MI6 and France intelligence. Do not believe non believers. They are not our friends. Always remember Quran and its recitation. Do not believe Saudi, Qatari. UAE and Bahrain's kings. They are enemies of Islam. Keep in mind the name of Yazid, Muyabia, Saddam and Gddafi. Please keep an eye on Monafeqin around you and an agent of CIA Shafiq,former prime minister of Mubarak. Please remember Almighty Allah and ask help from him. Please establish Islamic law in Egypt and expell Israeli envoy. Do not trust Turkey, they are not friend of Islam, especially, Erdogan and President of Turkey. They are friend of Israel and the US. Hazrat Ali Ibn Abu Talib not Hazrat Ali Ibn Abdullah, I am extremely sorry for unintensional mistake. You are 100 % crazy. And I am with the democratic process and was against Mubarak. Having secured the mandate of the electorate to make laws for the country (Egypt) as a legislative body,one requires no exceptional intelligence to perceive that the SCAF had foreseen the victory of the Muslim Brotherhood (al Ikhwaan el Muslimeen) in all the political arm of Egypt`s Democracy, which in thier view will jeopardze the selfish and hypocritic political,economic and millitary interests between them (the SCAF) and America,Israel,Saudi Arabia, Britain etc. That is why the SCAF devised an amateurish scenario by desolving Parliament, controling the budget and executive powers. My candid advice to the SCAF is that the should respect the legislative and executive will of the people and allow a peaceful transition to go on or else posteruty will judge them. "Absolute power corrupts absolutely"